Here I thought I would pick back up on my blogging once vacation started. I thought I was going to do a lot of thing during vacation. Truth is, I did almost nothing for 12 days… and it felt great. 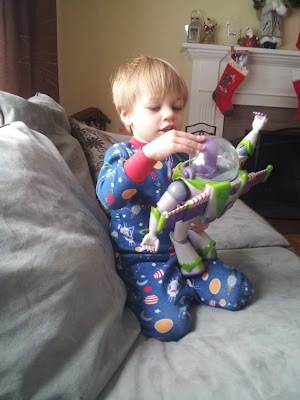 For the most part, I played Toy Story with my son (he plays with Buzz, while I play Zerg) and watched Netflix. 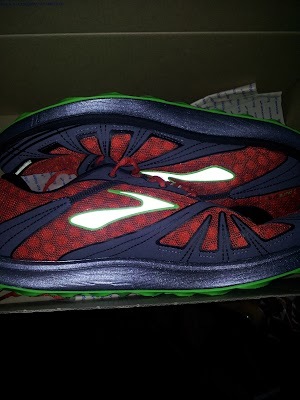 Lauren bought me two of my running wishlist items: a pair of Brooks PureGrits and an entry into the Hanson Running Circuit! I christened the PureGrits the next day when Anthony and I headed out for 4.5 miles in 6 inches of snow. It was the only time I ran all vacation and was pure pain, but we had fun. Also ticked off my list was a pair of compression sleeves, from my sister and a headlamp from my sister-in-law. Whats a new year without some goals? Drop some weight – I put on some serious weight since the marathon. So back to diet and exercise for me. Decided to give myfitnesspal a shot. Anyone else use it? Run a trail race – I want a race with single track. I love running trails, but rarely get the opportunity. Break some PRs – Its a given, but specifically I’d like to break 25:00 in the 5k and 2:00:00 in the half. A race a month – That should keep my training on track. I’m hoping I can run Back 2 the Beach and Romeo 2 Richmond as part of my circuit. I have 3 more days to decide if I’m signing up for Detroit before the price jumps. I guess that could be my 3 right there, but they all look fun. Anyone have opinions of any of these races? Suggestions? You should run Back to the Beach. I am volunteering a booth at the half-way mark giving away jello shots. Even if you pass up the shot I’ve heard the course is a great mix of trail and road, and hilly. Sounds like a blast, sorry I can’t run it myself. I think I’m pretty sold on B2B. I just hope I can run it as part of my circuit. I was excited to see the course wasn’t just 2 loops around the pond, but hitting the trails, too. Looks like they stay away from the single tracks, though.